Despite the fact you may not get in, the building is a lovely one to photograph and many people can be found outside milling about just taking pictures of the huge statue which over the years has caused some controversy. Some people love it and some people think it is over the top and too ostentatious for a religious figure. I love this building in old nicosia and not far from the Archbishop Palace. 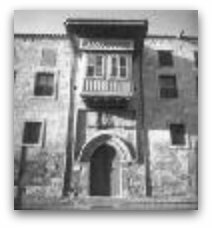 The was the home of the "Dragoman", basically a tax collector appointed to set rates and collect money. The house itself is a fantastic architectural represenation of the time and a wonderful building. Inside is a courtyard and the house has many rooms filled with antiquities of the day. Absolutely worth a visit in my eyes. The building can be found in Odos Patriarchou Grigoriou and opens Mon to Fri from 8.30 am till 3.30 pm in afternoon. There is a small entrance fee. You can call 22 305 316 if you need to check anything in advance. Don't miss it if you love architecture. 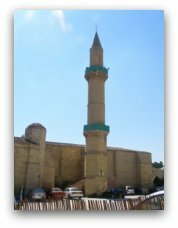 If you are visiting the House Of The Dragoman, then the Cami Omeriye Mosque is not far away. It is on Plateia Tillrias Street just down the road and you can see the minaret to guide you. It is open every day. It is the only place in the Greek south of the city where you can hear the call to prayer 5 times a day. Like several other mosques in the city, it has a christian origin. It was a former augustian church dedicated to John de Montfort. 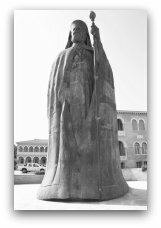 It was destroyed during the Ottoman conquest and a mosque dedicated to the Prophet Omar was erected on the site. The turkish baths are across the road. The entrance to here is below the street level and you can only really see the top of the door. I must mention I have not been into the Hamman myself, I am am a bit shy about these things but I am told by people who use it, it is a great authentic experience. 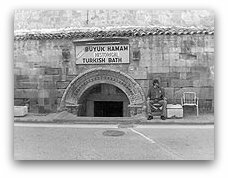 A proper turkish bath. I understand if you want to have a look round but not join in you can for a small fee. It would appear to be much cheaper than your hotel spa. If you are not shy I would give it a go! It all adds to your experience of the the real cyprus. Formerly the east and south's main entrance in to Nicosia, Famagusta Gate is one of three doorways set into the ancient Venetian fortifications that once surrounded the city. Also called 'Porto Giuliana' after its creator Count Giulio Savorgnano, Famagusta Gate was considered the principal entrance by the Venetians, stronger than its counterparts Paphos Gate and Kyrenia Gate. Constructed around 1567, Famagusta Gate formed an integral part of Nicosia's city walls, devised by the Venetians to defend the settlement from marauding Ottoman forces. While their success was limited - the city having been sacked, looted and burnt by the Ottomans in 1570 - large parts of the wall, including Famagusta Gate, remain in excellent condition. 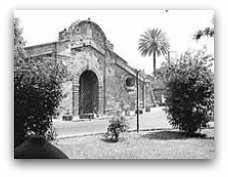 Indeed, Famagusta Gate is considered the best surviving Venetian construction in Nicosia. Of the three gates, Famagusta is the only construction presently situated in unoccupied Nicosia. Accessed via a large arched doorway, the heart of the gate is a vaulted passageway approximately 35 metres in length that previously led out to a surrounding moat. After a period of disuse, the inner rooms either side of the passageway were restored and now house regular cultural events including conferences, art exhibitions, lectures and theatrical performances.